We’ve been serving Las Vegas for 10 years. Over the past decade, we have added dishes, events, even a second location. Now what? Few people outside India know the dizzying number of breakfast items in Indian cuisine. So we decided to introduce Las Vegas to a wholesome, delicious Indian breakfast buffet. However, in trying to bring an Indian breakfast buffet to the table, we realized there is no one Indian breakfast. There are a vast number of diverse, breakfast dishes from across different regions of the country. So we decided to curate the staple, most popular items from a few states to add to our breakfast buffet. With the menu in the final phase, we are ready to announce it. Some of the dishes may alternate as needed. We will be serving bottomless Masala chai (tea) and South Indian Filter Coffee with our breakfast. Bloody Marys and Mimosas will be available at an additional cost. 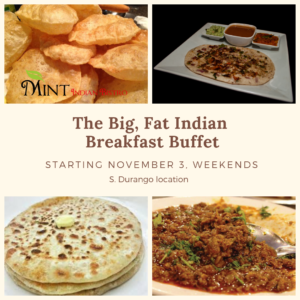 Starting November 3rd, our Indian breakfast buffet will be available on Saturdays and Sundays from 8 am to 10 am, only at our S. Durango location for $9.99 per person (plus tax). Our hours will change slightly. (Full hours at the end of this post). The final menu is true to our food mantra: “ flavorful, colorful, fresh Indian food that appeals to all five senses.” We also made sure (as we do anytime we create a new menu), that we cater to all dietary needs. Here’s a quick review of the menu. American pancakes – Let’s start with this classic because nothing says “weekend breakfast” like the classic, everyday pancakes. Uttapams – Yes, you can call them savory, Indian pancakes. These are not only vegan but also gluten-free. We entirely skip the eggs and milk for this one. The batter is made from a lentil and rice mix and topped with onions, tomatoes and bell peppers. Upma – An Indian semolina breakfast dish, Upma is a great, healthy alternative to an egg and toast breakfast, making it a perfect choice for vegans and vegetarians. It originates from South India. Poha – Poha is made from flattened rice, and is an anytime, nutritious snack. Completely vegan and gluten-free. It originates from Western India. Aloo sabzi with Puri – Alloo-puri is a satisfying meal by itself and is made from a delicious, tangy potato vegetable and served with puffed bread a.k.a puri. You cannot beat the contrasting textures and flavors of this dish. Masala omelet – A masala omelet elevates the everyday omelet to new levels of freshness, taste, and flavors. Stuffed Parantha – When you talk about an Indian breakfast, you can’t leave behind the Punjabi stuffed paratha. Stuffed with a vegetable, like potatoes or cauliflower, these are best enjoyed with pickles and yogurt. If you like to eat breakfast like a king, the parantha is your go-to breakfast. Keema Pav – The quintessential breakfast or late night item available on the streets of Mumbai, is the keema pav – it’s a delicious minced meat dish that seamlessly pairs with a pav (bun), and we will be making it halal with chicken and/or lamb. We turned 10 this month, and our chefs are excited to show you a whole new Indian meal. The Holidays are upon us, so let’s skip the toast and cereal, shake up our weekend morning routine, and wake up to a flavorful, comfort breakfast only at our S. Durango location. PLEASE NOTE: Starting November 3, this addition will affect our business hours at the S. Durango location.